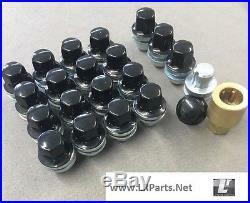 Range rover l322 ALLOY wheel nut set in black gloss With locking nuts. RANGE ROVER L322 WHEEL NUT SET. COMES AS A FULL SET OF 16 WHEEL NUTS FOR ALLOY WHEELS IN BLACK GLOSS WITH A SET OF 4 LOCKING WHEEL NUTS WITH THE LOCKING WHEEL NUT KEY - PERFECT IF YOU HAVE BLACK OR GREY ALLOY WHEELS. WE ALSO OFFER THESE WHEEL NUTS AS A SET OF 20 WITHOUT LOCKING NUTS IF YOU PREFER THE BUDGET OPTION. PLEASE GIVE ME A CALL ON 0151 486 0066 IF YOU WANT 20 NUTS. LR Centre Ltd sell everything you may need for the Land Rover and Range Rover market so feel free to get in touch. Thank you for your business. If you sign for goods without inspecting them properly and subsequently find that they are damaged you will be unable to make a claim. LR CENTRE LTD will accept returnswithin 7 days of customers receiving the item, after 7 days LR CENTRE LTD reserve the right to charge the cost of sending the consignment out originally. The item "BLACK ALLOY WHEEL NUTS LOCKING NUTS FOR RANGE ROVER L322 16 & 4 LOCK NUT LRC1110" is in sale since Wednesday, March 01, 2017. This item is in the category "Vehicle Parts & Accessories\Car Wheels, Tyres & Trims\Nuts, Bolts & Studs".liverpool" and is located in Liverpool. This item can be shipped worldwide.